A health-conscious individual might see a blender as an easy way to make a kale smoothie, while someone planning a party may view it as a gateway to glorious margaritas. A foodie, on the other hand, might use a blender to make hummus, nut butters, pizza dough, or ice cream. Thankfully, the best blenders are versatile enough to do all of the above. Sure, there are fancier blenders out there, but few people want or need to spend their entire paycheck on a glorified smoothie machine. Thankfully, Blendtec’s Designer Series offers a glut of awesome features and add-ons. The Designer’s custom, carbon-steel bearings keep the motor running quietly and efficiently, reducing wear and tear so you won’t have to get a replacement anytime soon. Cold-forged, stainless-steel blades with vertical wingtips whip around with dizzying speed, and the digital display features a timer to tell you exactly how long your blend will take. Blendtec’s unique Wildside jar prevents thicker blends from getting clumped up at the bottom, while capacitive, ultraresponsive touch controls allow you to adjust speeds on the fly with a mere touch of your finger. The Designer — this version, anyway — is also fairly compact, so it should fit underneath most wall-mounted cabinets, even with the jar attached. It even comes with a handy-dandy cookbook! Ninja‘s Master Prep Professional is cool, compact, and cost-conscious — great for college students or those who just don’t want to splurge on a blender. The 450-watt power pod holds up to 48 ounces of material, and the 40-ounce food processing bowl is perfect for dicing veggies or making chunky dips and sauces. There’s also a 16-ounce chopping bowl for salads. Convenient storage lids snap onto the Master Prep’s chambers for safe refrigeration, and all the containers are both BPA-free and dishwasher safe. This isn’t a heavy-duty blender, so don’t buy it expecting to puree root vegetables or blend for several minutes on end, but it’s an excellent value for those that just want the occasional milkshake or hummus spread. Unfortunately, top-of-the-line appliances often command a top-of-the-line price. Vitamix is one of the world’s most respected blender manufacturers, and the Professional 750 is just about the best of the best. 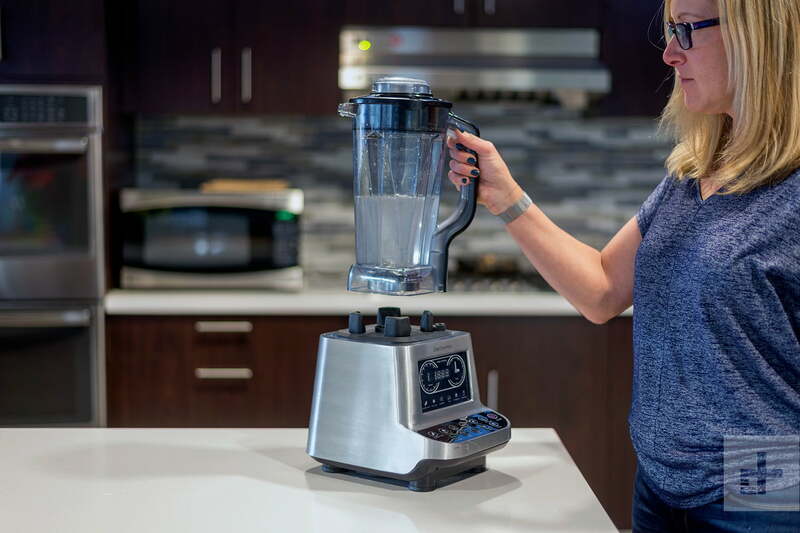 The 64-ounce jar is big enough to hold several smoothies’ worth of ingredients at once, and the blender has several pre-programmed settings for different purposes, all of which can be adjusted for speed (the dial runs from one to 10). Sound-dampening technology also ensures that the 750 won’t blow your eardrums out during use, and the self-cleaning feature is a godsend; simply drop in some water and dish soap, run the sucker for a minute, and it will be ready for whatever comes next! The 750 even includes a seven-year warranty, but it’s unlikely you’ll need it given the device’s durability. Maybe you don’t want to sacrifice counter space for your new blender. Maybe you don’t need to make complex recipes for multiple people. Maybe you just want a capable blender that can whip up a smoothie in a couple of seconds before you walk out the door in the morning. The Nutribullet by Magic Bullet is a hassle-free contraption that can satisfy your basic blending needs. The Nutribullet certainly isn’t the most powerful blender on our list, but with its 600-watt motor and blade design (four blades with two below), this compact device is capable of making hummus, creams, juices, and sauces alongside your your typical fruit smoothie. The blender also comes with a couple extra cups, so you can take your drinks to go. Don’t want to choose between a blender and a food processor? Look no further than Ninja’s Mega Kitchen System, which includes a massive, 72-ounce pitcher, a food-processor bowl, and two 16-ounce blend cups, which all fit onto the 1500-watt blend base (not simultaneously). Whether you’re looking to chop vegetables, make salad dressing, or pulverize ingredients for soup purees, the Ninja can do it in a matter of seconds. With more than two horsepower resting in its mechanized loins, it can be loud, but you’ll forget all about the tinnitus when you’re sippin’ on a blended marg with salt on the rim. The individual blend cups mean it’s easy to clean, but if you’ve got a big party to feed, the pitcher is large enough to handle that. Plus, it can even make cookie dough. Cookie dough!